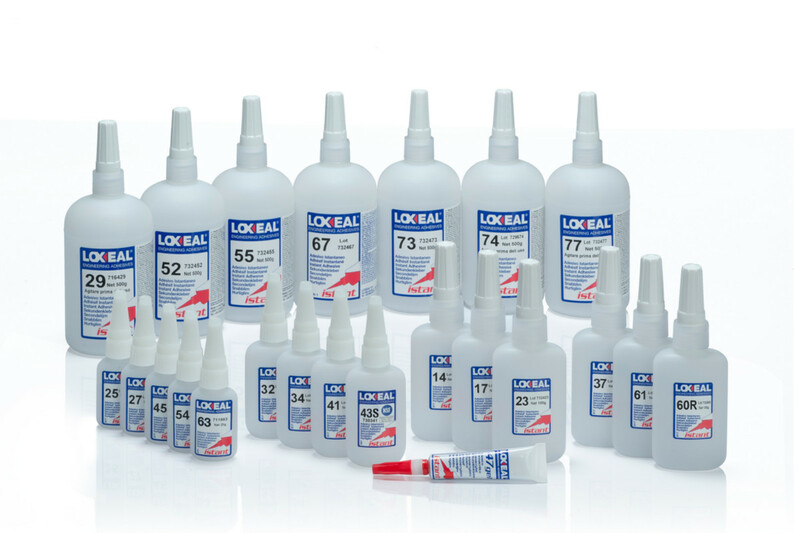 Cyanoacrylate Adhesives | Loxeal S.r.l. Cyanoacrylate became very popular in a short time as the fastest curing and more versatile adhesives available. The Cyanoacrylate range Loxeal Istant is developed to bond quickly a huge variety of substrates. They cure by reacting to small traces of moisture on substrates’ surfaces. Instant adhesive based on methyl cyanoacrylate, medium viscosity and high strength. Especially recommended for assembling rigid materials like rubber-metal or metal-plastic, its slow setting time allows the eventual repositioning of parts. Instant adhesive based on methyl cyanoacrylate, high viscosity and high strength. Especially recommended for bonding metals, rigid materials, ceramics and rubber and plastic on a metal support. High viscosity allows to fill large gaps and its slow setting time enables the eventual repositioning of parts. General purpose medium viscosity instant adhesive based on ethyl cyanoacrylate. For bonding rubber, metal, plastics parts. Medium to high viscosity, medium setting speed, instant adhesive based on ethyl cyanoacrylate. Designed for bonding irregular surfaces of plastic, rubber, metal, ceramic. High viscosity instant adhesive based on ethyl cyanoacrylate. Designed for bonding irregular surfaces of plastic and rubber. The slow-setting time allows adjustment of parts during assembly. Super fast instant adhesive on basis of ethyl cyanoacrylate. Low viscosity, designed for fast bonding of EPDM, foam rubber, difficult to bond rubber, soft/plastic. Super fast instant adhesive on basis of ethyl cyanoacrylate. Low viscosity, designed for fast bonding of EPDM, foam rubber; difficult to bond rubber, soft/plastic. Surface insensitive low viscosity instant adhesive on basis of ethyl cyanoacrylate. Very fast cure, even under low humidity conditions, on difficult to bond substrates, on porous and acidic surfaces as leather, wood, paper, carton, foamed rubber, EPDM. General purpose, surface insensitive medium viscosity instant adhesive based on ethyl cyanoacrylate. Insensitive to acidic surfaces, it is recommended for bonding of leather, wood and metals. Proven temperature strength up to +120°C with peaks for short times up to +150°C. NSF registered as acceptable for use as an instant adhesive (category P1) in and around food processing area. Instant adhesive based on ethyl cyanoacrylate. General purpose, medium viscosity and acidic surfaces insensitive, it will rapidly bond also leather, wood and metals. Temperature resistant up to +100°C, with peaks up to +120°C for a short time. Loxeal ISTANT 47 is a highly thixotropic ethyl cyanoacrylate adhesive, suitable for bonding of rubber and plastics together or on a metal substrate. Non-drip, non-sag gel, suitable for use on vertical surfaces. The high viscosity formulation and the delayed fixture time allow large gaps filling and parts repositioning. It provides proven temperature resistance up to +120°C with peaks up to +150°C for short times. NSF registered as acceptable for use as an instant adhesive (category P1) in and around food processing area. Gel, fluid ethyl cyanoacrylate adhesive, suitable for bonding of rubber, plastics, woods and ceramics. Designed to be easily dispensed by dosing systems. Its delayed fixture time allows parts repositioning; it provides temperature resistance up to +120°C. Very low viscosity instant adhesive based on alcoxy-ethyl cyanoacrylate. Specifically formulated for 3D printing applications, as a print Infiltrant for strengthening printed models produced with 3D printing technology based on powders/granules. Very low viscosity and delayed curing time allows good depth of penetration into parts and a wicking effect. Usage of Loxeal 60R helps not only to strengthen the parts, but to achieve a smooth and good aesthetic appearance too. Alcoxy-ethyl formulation reduces blooming effect and it is clear, low odour and non-irritating. Especially suitable to be used in non-ventilated or closed areas (no powdery residue and no heating). Low viscosity instant adhesive based on alcoxy-ethyl cyanoacrylate. Low odour non irritating, non blooming effect, for appearance-sensitive assemblies. Especially suitable to be used in non ventilated or closed areas. Instant adhesive on basis of alcoxy-ethyl cyanoacrylate. Low odour not irritating, non blooming effect for appearance sensitive assemblies. Especially suitable to be used in non ventilated or closed areas. Delayed setting time allows adjustment of parts during assembly. Instant adhesive on basis of alcoxy-ethyl cyanoacrylate. Low odour not irritating, non blooming effect for appearance sensitive assemblies. Designed for bonding plastic and rubber together or with metal. High viscosity allows to fill large gaps. The slow fixture time allows adjustment of parts during assembly. Flexible medium-high viscosity instant adhesive based on ethyl-cyanoacrylate. Fast cure on flexiblesubstrates, suitable for porous surfaces. Rubber toughened low viscosity Ethil-Cyanoacrylate adhesive with increased flexibility and impact resistance. Suitable for bonding rubbers and metals. Curing time is designed to allow right positioning of the pieces before assembly. Good temperature resistance up to 120°C. Rubber toughened low viscosity Ethil-Cyanoacrylate adhesive with increased flexibility and impact resistance. Suitable for bonding rubbers and metals. Curing time is designed to allow right positioning of the pieces before assembly. General purpose high viscosity Ethil-Cyanoacrylate adhesive with superior peel and impact resistance. Suitable for bonding rubbers, metals and plastics. Toughened, high viscosity Ethyl-Cyanoacrylate adhesive with improved flexibility and impact resistance. Good temperature resistance up to +120°C. Fast setting modified ethyl cyanoacrylate adhesive, with improved temperature resistance and low viscosity. Specifically suitable for bonding rubbers, plastics and metals where prolonged heat exposure is required. Temperature resistant up to +180°C. High impact strength instant adhesive. Suitable for rubber, plastic and metal joints. High temperature resistant and medium viscosity formulation for common gaps filling. Low setting time allows easy and correct positioning of the parts to be bonded. Low viscosity, fast curing and highly flexible instant adhesive based on ethyl cyanoacrylate. Designed to bond rubbers, plastics, metals and dissimilar surfaces. The very high elongation of 100-150% allows an excellent shock and impact resistance. Low viscosity for a capillary penetration into preassembled parts. Easy to use both manually or through dosing system. Highly resistant to temperature and thermal shock. Fast curing, medium viscosity, highly flexible, instant adhesive based on ethyl cyanoacrylate. This adhesive shows flexibility and sealing properties, still maintaining the fast curing time of a cyanoacrylate. The very high elongation of 30-80% allows an excellent resistance to shocks and impacts. High viscosity and thixotropy, highly flexible, low adhesive strength instant adhesive based on ethyl cyanoacrylate. an easy removable or temporary bonding is required. High viscosity to fill large gaps and vertical bonding. Delayed curing time to allow the eventual repositioning of parts. The very high elongation of 50-100% allows an excellent resistance to shocks and impacts. Low viscosity, highly flexible, low adhesive strength instant adhesive based on ethyl cyanoacrylate. Designed to bond rubbers, plastics, metals and to secure small galvanized, nickel plated, tropicalized screws and plastic fittings when an easy removable or temporary bonding is required. The very high elongation of 300-500% allows an excellent resistance to shocks and impacts. High viscosity, highly flexible, low adhesive strength instant adhesive based on ethyl cyanoacrylate. High viscosity to fill large gaps. Delayed curing time to allow the eventual repositioning of parts.